Argentina is emerging as a good example why politicians aren’t able to embrace proper monetary policy. 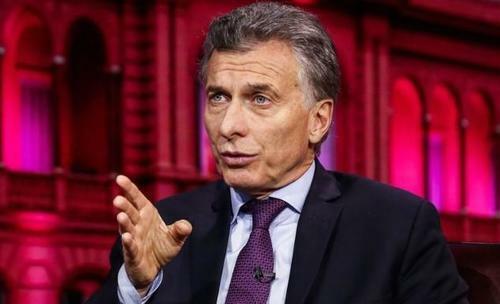 Take President Mauricio Macri, who finds himself in what Bloomberg has dubbed a "catch 22" - the more he tries to shore up Argentina’s deteriorating financial situation, the less likely he is to win reelection in 2019. That’s because the proper measures that need to be taken in order to help the country's economy, while necessary, will also be extremely unpopular with the general public. Recently, Macri accepted the largest loan ever from the International Monetary Fund and made a promise to brutally cut spending and raise taxes. This comes at the same time that the Argentine central bank pushed interest rates to the highest levels in the world. But money managers at firms like Blackrock simply aren’t convinced that he’s going to be able to retain his position long enough to have an impact. Isabelle Mateos y Lago, chief multi-asset strategist at BlackRock Investment Institute, told Bloomberg that "The determination of the Argentine government to do the right thing is not in doubt, but its ability to do it for long enough is. That has prevented markets from rallying more convincingly so far." 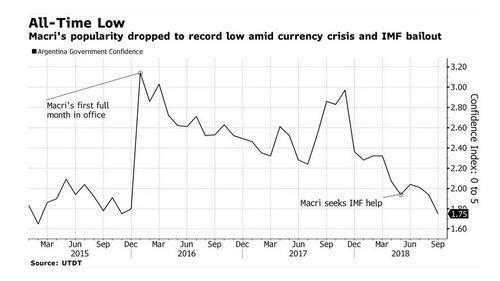 Macri's standing in the polls has dropped to all-time lows, with support for him falling to 31% in early September as Argentina fell into its second recession in three years. Validating BlackRock's view, every step that Macri has taken to shore up the economy has made him less popular and has given ammunition to his political opponents. Turning to the IMF for help has been seen as an especially unpopular move because many local believe that the country's last sovereign default was caused by the IMF. It's truly a lose/lose situation for Macri that has been reflected in his approval rating. Adding insult to injury, the country's currency has collapsed crushing the purchasing power of its citizens. One of Macri’s opponents in 2019, former President Cristina Fernandez de Kirchner (CFK), will be the beneficiary of his unpopularity, just because of the hard line Macri has taken on monetary policy. James Gulbrandsen, a Rio de Janeiro-based money manager, told Bloomberg: "People will always vote with their wallets. The economy typically trumps outrage over corruption." In addition to Fernandez de Kirchner, Macri will face a field in 2019 that includes Juan Manuel Urtubey, centrist governor of Salta who’s affiliated with the Peronists and Sergio Massa, who is the ex-chief of staff to former President Fernandez. ..."illicit association" and of having received bribes from public works contractors during her tenure in the presidency between 2007 and 2015, according to court documents. Fund managers also blame her for years of currency controls that deterred foreign investors, a decade-long dispute with creditors and a system of subsidies that fueled the budget deficit. Gulbrandsen then warned that "foreign investors will probably throw in the towel and give up on the country if it returns to Peronism." Some believe that Juan Manuel Urtubey would be better than other Peronists, as he is at least seen as providing tacit support to the mission of spending cuts after attending a recent press conference with Economy Minister Nicolas Dujovne. Macri making it to the election in 2019 would be an accomplishment in and of itself. According to Bloomberg, no non-Peronist has ever even finished their elected term over the past seven decades. Meanwhile, seeing their economy collapse yet again, Argentinian residents who voted for President Macri went on record telling Bloomberg they "wouldn’t do it again." "I see a country that’s lost its way. They need to find a way to stop this slide," one 46-year-old bank worker told Bloomberg after buying some dollars she hoped to sell later. She concluded, "The problem is, they don’t know what to say." 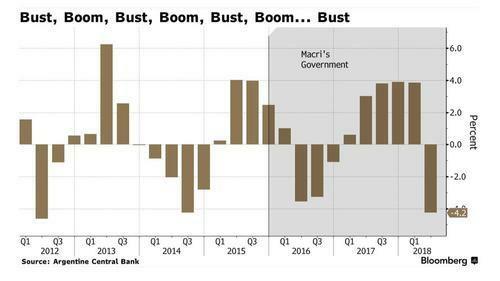 The paradox facing Macri mirrors the one facing developed world politicians who are afraid of setting any kind of a hard line when it comes to supportive monetary policy. This has led not only the United States, but also Europe and Japan to engage in decades of quantitative easing that will, at some point, put most nations in the same boat as Argentina. The only question is when.